Cinch by dexbaby is an integrated line of infant products and stylish gifts that brings peace of mind to parents through safety, simplicity and value. For parents whose vocal cords can't hold out for 200 rounds of "Hush Little Baby," a sound soother is a must for baby bedtime routines. And the Cinch Sound Sleeper in this stylish plush animal is the perfect choice. This attractive sound sleeper features a high quality speaker and has two timer settings of 15 or 60 minutes so you can choose the best length of time for your baby and a volume control. It's compact size with the attachment variety, makes it easy to travel with and always give your little one a sound sleep and yourself peace of mind! Doctors and sleep experts recommend a consistent, relaxing sleep routine for newborns and older babies. Freeing baby's sleep environment of jarring or distracting outside noises is an important step in creating a soothing space for sleep. The Sound Sleeper provides just enough peaceful background noise to block household hubbub. Once baby becomes familiar with the sounds of this machine, s/he'll probably start yawning the minute s/he hears it! The sounds of a Sound Sleeper don't have to be boring, just relaxing and repetitive. Experiment with the various sounds to find the perfect soporific. Makes for an excellent baby shower gift! CLEANING INSTRUCTIONS - Wipe off with a slightly damp washcloth or sponge. Do not use any cleaning liquids on it. 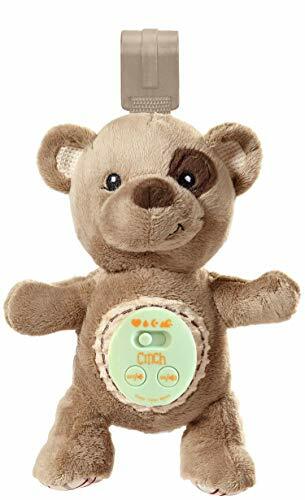 MIRACLE SLEEP AID - The mini teddy bear sound soother helps alleviate some of the anxiety of bed time by incorporating the soothing and familiar sounds of the womb. Mom and dad will sleep better too. It also features 2 timer settings for automatic shut-off after either 15 or 60 minutes. 4 SOOTHING SOUNDS - Mother's Heartbeat - Actual recorded sounds of the womb help remind baby of the calming serenity of mommy's womb; Babbling Brook, Summer Night and Ocean Surf. Audio box uses 3 AAA batteries (included). SAFELY SECURES - It features a quality Hook, Loop strap and a playard clip to allows you to securely attach it to a crib, playard, cradle, swing, stroller, car seat or anywhere you can find a spot to wrap the loop around. Its compact size makes it easy to travel with and a piece of mind necessity. If you have any questions about this product by Cinch by dex, contact us by completing and submitting the form below. If you are looking for a specif part number, please include it with your message.